The Garmin Forerunner 35 is a sub-$200 GPS running watch, making it a significantly cheaper option than high-end Garmin running watches like the Forerunner 630 and the Forerunner 235. But don't let that price make you think you're getting shortchanged here. This is still a running companion that's crammed with features, including an optical heart rate sensor, smart notification support, activity tracking and plenty of battery life to boot. 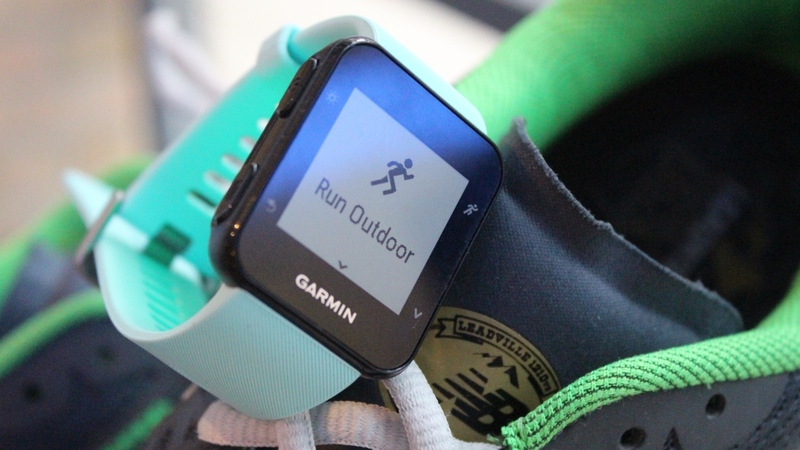 You do have to live without some of the more comprehensive running metrics you'd get with Garmin's pricier watches, but it caters for beginner and experienced runners who are happy to keep things simple. We've been putting the Forerunner 35 through its paces, on the treadmill, out for training runs and in race mode to see if it's up to the task. Here's our extensive verdict. If anything screams budget on the Forerunner 35, it's the design. Garmin has shown with our Fitness Tracker of the Year, the Vivosmart HR Plus, and its Fenix 3 collection that it is capable of making a good-looking wearable. Unfortunately, that's not something you can really say about the 35. It's the ugly duckling of the Forerunner family, and undeniably a sports watch with its small, square plastic case and thick black bezel surrounding a not-so-super-sharp 128 x 128 resolution monochrome screen. There's no touchscreen here, although it's still a haven for fingerprint smudges. If you remember what the first generation Garmin Vivoactive looks like, that's pretty much what you've got here. Garmin does try to add a bit of colour, offering a choice of black, blue, green or white watch straps. Our blue strap was light and comfortable to wear and didn't press too tightly against the skin as some sport bands can; it's the kind of strap we're accustomed to seeing on Garmin watches. Aside from our obvious distaste for the 35's look, it is at least very easy to operate. There are four physical buttons in total surrounding the watch face. The one in the top left corner is dedicated to a backlight, which can be customised so that it'll turn on for certain tracking modes. Holding it down will also turn the watch off to help conserve battery life. Below that is the back button, which navigates you out of menus but also leads to a screen where you can view tracking history and milestones, adjust settings and set up alarms. The top right button is your route to the multiple tracking modes. Here you'll find dedicated modes for cardio, walking, outdoor running, indoor running and cycling. Completing the setup is the navigation button that takes you through additional menu screens where you can check in on resting heart rate, notifications, step counts, calorie burn, active minutes, last workout data and the weather. This button also doubles as a means to control music playback, a first for Garmin watches. That means you can skip tracks and play/pause music without reaching for your phone. Around the back is where you'll find Garmin's proprietary Elevate optical heart rate sensor, delivering continuous readings throughout the day and night as well as during training sessions. It's also been slapped with a 5ATM certified waterproofing rating, which means you can take it for a dip in the pool up to 50 metres. It just won't track swimming sessions like the Fenix 3 or the Vivoactive HR. While the Forerunner 35 can track cycling (you can pair with footpad and cadence sensors) and cardio sessions, it's geared towards running and that's what we focused our testing on. There is of course built-in GPS, although it lacks the GLONASS support included on higher-end Forerunner watches. That might be partly why we didn't enjoy the kind of super speedy signal pick-ups in both open and built-up running surroundings that we enjoyed on something like the Forerunner 630. While you're missing out on the advanced running metrics recently introduced to the Forerunner range (stride length, vertical ratio, vertical oscillation), there's still plenty on board to keep most runners satisfied. In running mode, there are two data screens you can switch between, along with checking in on the actual time. Split into three segments you can view distance, time and pace on the first screen while the second screen displays heart rate zone, current heart rate and calories burned. Before jumping into tracking mode, there's an option menu where you can customise run modes to introduce virtual pacer or interval training into your session. You can also set up alerts based around hitting certain distances or heart rate zones, adjust the way data fields are displayed and swap in pace or speed metrics. Once your run is completed and you've saved the session, there's a nice breakdown of your run including details on heart rate zone, cadence, steps, and average pace per laps. On a lot of running watches you'd need to go to the companion app to see such a comprehensive breakdown of a session. As far as accuracy is concerned, we were happy with what the Forerunner 35 served up as far as GPS distance tracking goes, although as mentioned it did on occasion take more than a couple of minutes to lock onto a signal. The screenshots above show how it fared against the TomTom Spark 3 GPS running watch in a 10 mile race. For indoor tracking, the Forerunner 35 relies on the built-in accelerometer to measure distance. It's nowhere near as reliable as GPS and, much as we've found with other running watches that rely on this method, it can be hit and miss when it comes to accuracy. Optical heart monitoring is something that Garmin has thrown into the mix recently, with the Forerunner 235 and Vivosmart HR+ among the first two devices to benefit from the company's proprietary Elevate heart rate sensor technology. Its uses are twofold on the Forerunner 35. The first is to relay information about your average resting heart rate and real time bpm readings. From the watch, a graph will display readings from the last four hours. This feeds into your activity tracking data to give you a more comprehensive view of your daily health. It also forms part of the run tracking, where you can view heart rate average and the heart rate zones you've spent the most time in during a session. We didn't have the most positive experience using the technology on the Forerunner 235 and the Vivosmart HR Plus and it's a similar story with the 35 when you delve into high intensity training territory. In our 10 mile race (above), where our pace was steady and consistent, there was a 1-2 bpm difference between average heart rate readings and maximum heart rate readings recorded in comparison to the TomTom Spark 3, a wrist-based optical heart rate sensor we've come to rely on for accuracy. When we put things to the test on a treadmill with the Polar H7 chest strap and introduced some interval running, the Forerunner 35 initially records quite erratic readings before it settles down and becomes more consistent. While HR average seems consistent, there's a great disparity with maximum HR. It's something we've found with other optical heart rate monitors where so many factors can impact on delivering reliable readings. If you've read any of our most recent Garmin reviews then you'll know we're big fans of the company's approach to activity tracking. It's not just about what you can track, but how the tracking data is used to keep you motivated to stay active. You still get the Vivosmart and Vivofit-inspired features like the Move Bar, which builds up on the main watch screen and will flash up a message to get moving when you've been inactive for long periods. The bottom-right physical button lets you scroll to an additional screen where you can view step count and the adjusted target step count. You also get the same automatic sleep tracking, which serves up the kind of data that's not too dissimilar to that found on a Fitbit. Putting it through its paces alongside the Fitbit Flex 2 and the TomTom Spark 3, we were more than satisfied with the data. It's the motivating features that really win it for us though. Garmin has done a similarly good job of building smartwatch features into its running watches so far, and the trend continues with the Forerunner 35 and its notification support. From the Garmin Connect app, you can customise how these work, letting you turn them on or off during an activity and setting whether you receive a vibration alert or the notification simply pops up on the watch screen. It works with third-party apps, streaming them to your watch where you can expand to read and clear to delete them once you're done reading them. You can't respond to notifications, but when a phone call comes through you can choose to accept or reject from the watch. Additional smartwatch-esque features include the ability to view weather and music control playback but what you do miss out on is Connect IQ support. That means that unlike the Fenix 3 or Vivoactive HR, you can't add additional data fields, apps or watch faces from the dedicated app store baked into the Garmin Connect app. Garmin does let you switch between a single analogue and digital face but that's your lot. Crucially, the smartwatch experience is solid and reliable. Notifications stream in and it's easy to deal with them from the watch. If you want a running watch with smartwatch features, it delivers well on that front. When you've logged your run or workout and you need to dig further into that data, Garmin Connect is where you head. Not a lot has changed in terms of our experience with Connect. The iOS, Android and Windows friendly smartphone app is consistent across platforms, but it remains one of the most overwhelming apps to get to grips with. We can't fault Garmin for what it is on offer here. There's great third-party app support for the likes of Strava and Apple Health, the ability to drill into different activities with plenty of additional metrics and graphs for a runner to get their teeth into that you can't view from the watch itself. Sometimes less is more though, and that's something Garmin should take on board. While it's great to be able to delve into what seems like endless settings, we're still finding ourselves searching around for things that should be so much easier to find. We've always been pretty pleased by the kind of battery life Garmin's running watches deliver and it's a similar story with the Forerunner 35. Garmin claims you should get nine days of battery life in non-GPS mode and 13 hours of tracked running. The Forerunner 235 offers 11 hours of tracked training and nine days when using all of the features to the max, to put that into perspective. In our testing, we were more than happy with the 35's staying power. No doubt the decision to opt for a very basic monochrome display plays its part, but even without entirely turning off the watch it can comfortably make it through those nine days. GPS battery performance is on the money as well. It's going to be enough for a week's worth of solid running. If you reduce features like notifications and continuous heart rate monitoring, you can expect non-GPS mode to push closer to a couple of weeks. The Garmin Forerunner 35 might not be a looker, but it does offer a solid all round running watch experience. It covers the basics well and is easy to get out running with. If you put in the time, there are plenty of other modes and settings lurking around the software and the hardware that runners and smartwatch fans will appreciate as well. At just under $200/£200, it’s competing with the likes of the TomTom Spark 3 Cardio, which is a bit of a Wareable fave, although the Spark does lack the smart notification support and music playback controls you get on the 35. If you’re willing to compromise on the lacklustre design, there’s a lot to like about the Forerunner 35, which is a great entry-level running watch.